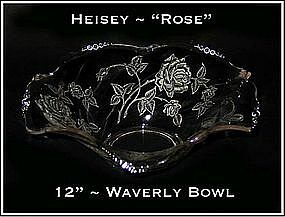 This is the bowl that goes with the candles in Rose that we have listed also. 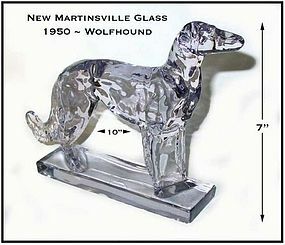 Made by The Heisey Glass Co. from 1949-1957. Excellent condition! 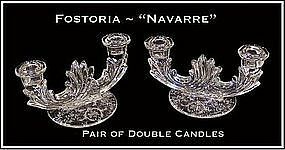 These Navarre double candles were made by Fostoria and are in excellent condition! 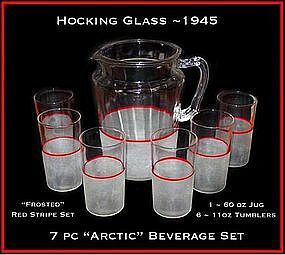 This 7pc beverage set was made by The Hocking Glass Co. and was shown in their 1932 catalog. It was one of the first bright and cheerful glassware sets to appear after the depression to help brighten kitchens. The pitcher holds 60 oz and the 6 tumblers hold 11oz each. All are in excellent condition! These elegant glass mushroom candles were made by The Paden City Glass Co. in the early 1930's. One is slightly darker in color, both are in excellent condition! 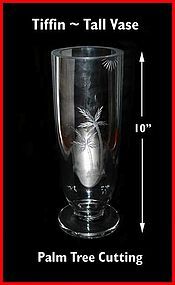 This large heavy vase with a Palm Tree Cutting was made by Tiffin Glass and is in excellent condition. 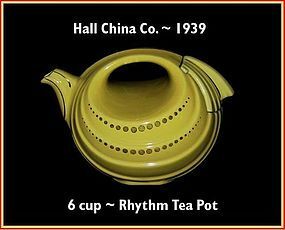 This yellow with gold decoration Rhythm tea pot was made by The Hall China Co in 1939. Very slight worn spot of gold dec on top of handle. 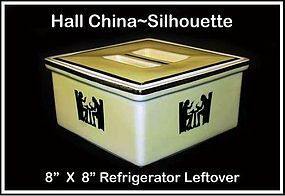 This 8” X 8” refrigerator leftover was made by Hall China and has the Taverne, or Silhouette pattern on it. Excellent condition with only very minor platinum trim wear. 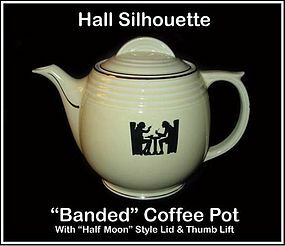 Signed with the Hall Superior Quality Kitchenware mark on it. These are getting hard to find! 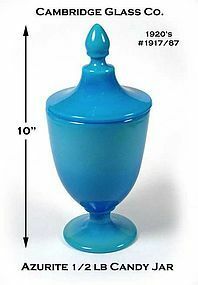 This Azurite Blue 1/2 lb covered candy jar was made by Cambridge in the 1920’s. 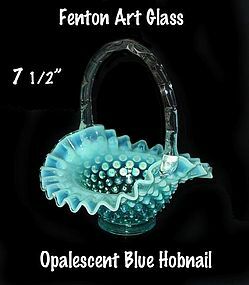 It is 10 inches tall and very beautiful! Cambridge made some of the best opaque colored glassware in this country! 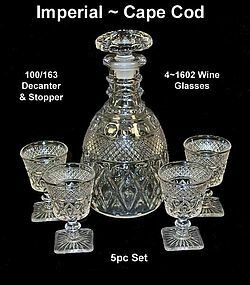 This 5pc Imperial Glass Cape Cod Wine & Decanter & Stopper set is in excellent condition! No chips, no scratches, and no cloudiness! Very nice. Estate fresh from here in NW Ohio. 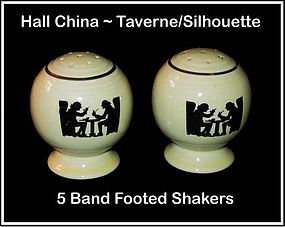 This photo is the actual set we have for sale...not a catalog photo! 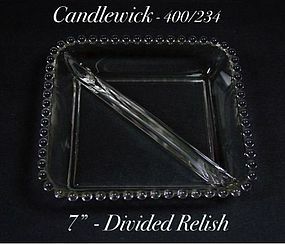 This Candlewick 400/234 7 inch square divided relish was made by the Imperial Glass Co. from 1957-1967. It is in excellent condition, except for a tiny burst bubble on the top of the divider. This is a hard to find item. No scratches or chips. 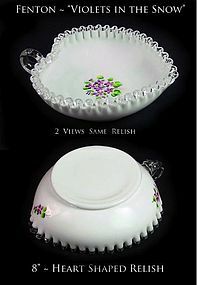 This Fenton Silver Crest, Violets in the Snow, 8 inch heart shaped relish is in excellent condition, 1st Quality and extremely nice! No damage or flaws of any kind on this piece. 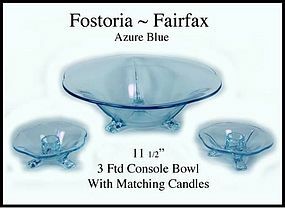 The pattern is also on the outside of the dish in 3 different places. We will gladly combine shipping on multiple purchases. 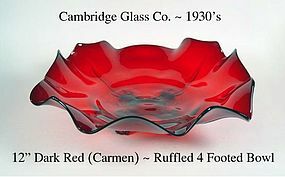 This Carmen, or Red, 4 footed ruffled console bowl was made by The Cambridge Glass Co in the 1930's and is in excellent condition. Very dark color! 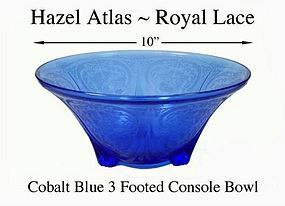 This cobalt Royal Lace 10 inch console bowl was made by The Hazel Atlas Glass Co. in the 1930's. It is in great condition!